Bridging the gap between electronic, jazz and hip-hop, Kieran Hebden has been one of our most beloved artists of the last decade. Forever an ambassador to the electronic field, it goes without saying Hebden is a true pioneer and living legend. In addition to his solo work, Hebden has remixed and collaborated with artists ranging from Aphex Twin, J Dilla, Sia, Bloc Party, Andrew Bird, Burial, Kings of Convenience, Madvillain, Radiohead and the late jazz great, Steve Reid. Never to be boxed in, Hebden can be abstract, cinematic and suited for the dance floor. His latest album, There Is Love In You, is out now on Domino and already guaranteed to land on several year-end lists. The second single, "Sing", just dropped last month and is accompanied with a stunning Floating Points remix. 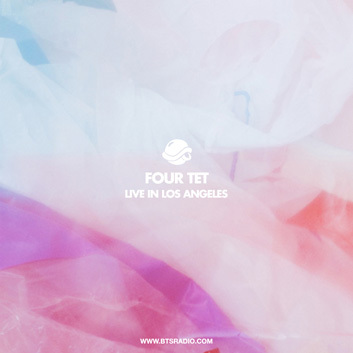 Last February, we had the complete honor of recording Four Tet live in Los Angeles. An exclusive recording for Andrew Meza's BTS Radio, check out this essential live set. Domino, The Echoplex, Sebastian Hackett, Eric Huff and Scott Wolff.